Kevin Harvick, driver of the No. 4 Busch Beer Ford Fusion for Stewart-Haas Racing (SHR), is preparing to make his only trip to New Hampshire Motor Speedway in Loudon this year as the team is set for Sunday’s Monster Energy NASCAR Cup Series Foxwood Resort Casino 301. The realigned Cup Series schedule for 2018 dropped one of the traditional two Cup Series races run each year at the mile oval since 1997. New Hampshire’s typical second race date was in September during the first round of the NASCAR playoffs but was moved to Las Vegas Motor Speedway, another racetrack owned by Speedway Motorsports Inc., to open this year’s NASCAR playoffs. The change is significant for Harvick as it marks the first time in his Cup Series career dating back to 2001 that he’ll only make one trip to Loudon. The Bakersfield, California native has two Cup Series wins at New Hampshire, both coming during the September race weekend which was given to Las Vegas. His first came in September 2006, when he started from the pole, dominated the race by leading 196 of 300 laps and beat runner-up Tony Stewart to the finish line by .777 of a second. His most recent Cup Series win at New Hampshire enabled the No. 4 team advance to the second round of the playoffs in 2016 after a 20th-place finish at Chicagoland Speedway in Joliet and just before a 37th-place finish at Dover. The 2014 NASCAR Cup Series champion had mixed results at New Hampshire in 2017. In July, he scored a top-five finish but, in September, he was caught in an eight-car accident on lap 150 and finished 36th. Harvick and the No. 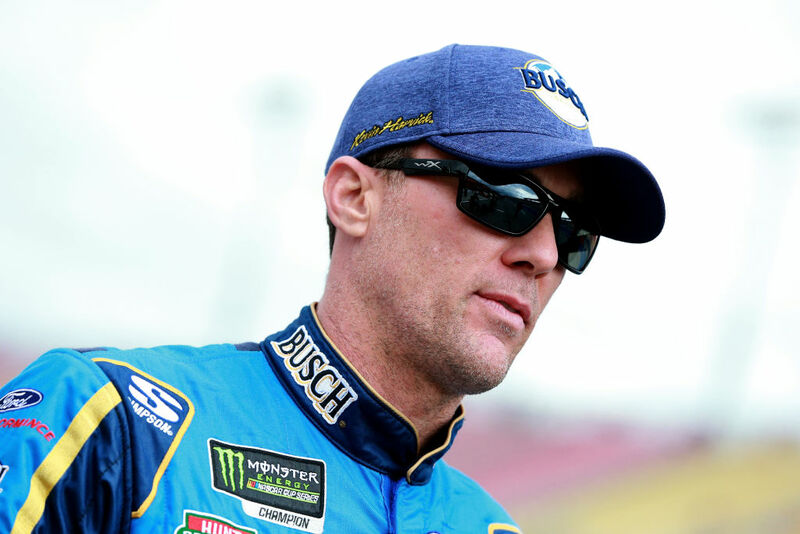 4 Busch Beer team are looking to continue their hot streak during which they have scored two wins, two poles, eight top-five finishes and led 512 laps in the last 10 races. Also important for Harvick this weekend and the six races that follow is the accumulation of playoff points that are so critical at this point in the season. Thus, even more pressure to start up front and, ultimately, to try and win the Busch Pole award. Harvick’s 27 playoff points heading to New Hampshire rank him second to Kyle Busch, who leads the series with 30. Martin Truex Jr. also worked to close the gap to Busch last Saturday at Kentucky Speedway in Sparta, when he scored both stage wins and the race win lift his playoff point total to 25, just two behind Harvick. The “Big Three” of Harvick, Busch and Truex has accounted for 14 of the 19 race wins in 2018 and 65 percent of the total playoff points accumulated – 82 of 126 playoff points available through 19 races. The best way to score maximum playoff points in a race is to start up front, earn stage points and win races. Harvick and the No. 4 team can accomplish all of those goals with a win this weekend in the team’s only visit to the Granite State in 2018. What makes the fans in Loudon so intense and so loyal? What does it take to be successful at Loudon?